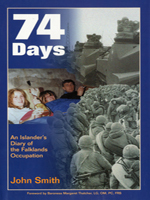 First published in 1984, this book is the story of the 1982 occupation as observed and written by a Falklander. This second edition has an updated postscript and previously unpublished photographs. It is a day-to-day diary account of that period illustrated with more than thirty photgraphs telling us what life was for John Smith, his family and friends during the two and a half month period of occupation by Argentine military forces. Bringing to life the emotions, characters, hardships and humdrum of the days under occupation, it offers us a unique and detailed insight into what was actually like to live during that uncertain time.